The hour was late, but it was still hot. Frijoles Canyon loomed to my right, showcasing its surfeit of stratigraphic tuff and igneous ash layerings and ponderosa pines. I was about a hundred and fifty feet up on the mountain face in a reconstructed cave with a ceremonial kiva or well. The cave was accessible by climbing a series of narrow steps and four ladders inclined against the steep rocks: not recommended for those with a fear of heights. 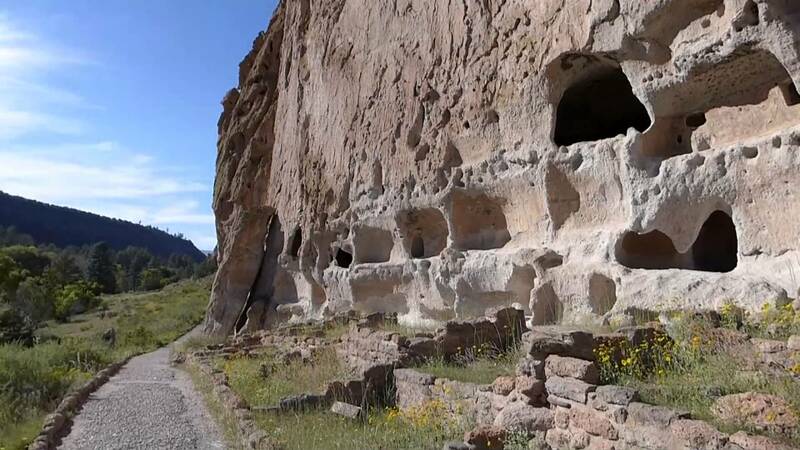 On this particular day I was alone there; it was a hot weekend, and not too many hikers and tourists had scattered themselves around Bandelier National Park where the cave’s located. It’s tough not to fall in love with the American Southwest. There is no other part of the United States which combines so uniquely and generously Native American, Spanish and Anglo-American culture with spectacular desert and mountain expanses as far out as the eye can see. Our trip had started with the Grand Canyon, whose first display of infinite recesses and a blaze of colors is sufficient to stop almost any conversation for a few seconds. It had then continued through Indian reservations spread across three states – albeit still crammed into nooks and crannies relative to their original seemingly limitless expanse – which took us through the incredible towering structures of Monument Valley to New Mexico. In Monument Valley, our guide had made us lie down on the cool, hard bed of a sandstone cave while gazing up at the giant outline of an eagle carved out by water, wind and time into the ceiling of the cave. An older Native American had sung an ancestral song while his nephew who accompanied us played a trifurcated flute, the sounds reverberating through the cavernous structure. It couldn’t have been much different thousands of years ago, when men and women not very different from us made such rituals part of their lives, when they must have silently held communion with dead and living kin looking out across a blanket of stars and red desert. The stunning mountain wonders of New Mexico are always a treat for the eyes, but nothing evokes a sense of awe and beauty for me as much as Valles Caldera. As you drive past Los Alamos into the Jemez Mountains, you are taken completely by surprise as you navigate a switchback and are suddenly greeted with what looks like a huge African Savannah, an immense grassy expanse reaching out across the horizon with a considerable hill jutting out in the middle; you half expect to see herds of zebras or bison stampeding across the plains. If you didn’t know better, you would think you were the first humans to emerge from the wilderness into this giant volcanic field, formed by a massive eruption about 1.2 million years ago. The hill is a lava dome, formed by the violent ejection and slow outflow of hot magma; time has carpeted the dome and the surrounding field with vegetation since its creation. It used to be a lake once. Mountains dotted with ponderosa pines and Douglas Firs rim the caldera. The floor of this giant bowl is spread across over fourteen miles, and the sheer size became clear when, unaided by binoculars, what looked like ants turned out to be herds of hundreds of grazing elk. Ten thousand years ago the natives wandered over this expanse, grazing their own livestock and looking for hard, black obsidian for their arrow and spear heads. Given how much the region has remained constant for thousands of years, even as geothermal activity and hot springs have gently but firmly caused local deformations, it’s hard not to feel a connection with those who came and went here over the years; their eyes saw what ours did. The same sense of shared kinship strikes one in that cave in the Bandelier tuff which might have held twenty five Anasazi, or Ancestral Puebloans. Eight hundred years ago the place was a beehive of activity, with the peak population predicted to be about five hundred. Between the 12th and 13th century the Anasazi departed, dispersed and largely disappeared; for what reasons it’s still debated, although a mix of climate change – especially drought – and economic instability seems to be our best bet. While they lived in regions like Bandelier and Chaco Canyon they created a flourishing culture, both primitive and enlightened in parts. Economic trade with neighboring tribes was widespread, and animal skins, gems, pottery were exchanged extensively at key commercial sites like Chaco Canyon. The natives pioneered novel methods of harvesting and storing corn, of insulating their ground and cliff homes from excessive heat and cold, of waging war and brokering peace. But perhaps no other creation of the human mind infused their culture as much as religious belief. It was everywhere. From dictating what directions to build their caves in to how to harvest their grains to elaborate rituals for burying their dead, religion filled every nook and cranny of their thoughts and emotions. It was pagan worship writ large, and no other relationship exemplified its intensity as much as their connection with nature. It was a connection that I especially pondered in the ceremonial cave, and one that was by no means unique to Native Americans. But seen from the eyes of a native, everything that I was seeing – the pines and firs and medicinal plants in the canyon, the mountain lions and bears and rattlesnakes lurking (fortunately far), the wind howling through the trees, the rough grains of cave wall tuff – imbibed special and essential spirits, good and evil. You went through elaborate rituals to please the good spirits and appease or drive away the evil ones, and you could not imagine a life without them. Every living and non-living thing was a religious symbol of sorts, and the random motions of nature and life – an eagle jousting with a snake, a mountain lion choosing not to eat you, a trifecta of pines silhouetted against the dimming sunset – were pregnant with meaning and prediction. Nothing just existed, and surely nothing was the result of blind chance and the vagaries of geological and biological events. If I closed my eyes and took it all in, I could almost fancy myself at night in this hollow; wearing elk skins, beating drums, chanting, drawing geometric figures on the walls, reassuring myself that I was appeasing my favorite spirit with my actions. Dusk was approaching, so I took in the view one last time and climbed down the ladders and single-file steps, quickly attaching and detaching my hands from the still hot rungs. The path to the visitor center at Bandelier runs through a pleasant tree-lined corridor intertwined with a stream, a stream that was muddy and wet then but which always runs the risk of sustaining unexpected flash floods. And as I walked and pondered my time during the previous few days in the cave and in the Jemez mountains and among the red sandstone monuments, I was suddenly struck by two thoughts. First: Thank God for modern science. And second: it’s not that simple. With its overabundance of sprits and essences with their own agency, the world which the natives inhabited was a world full of wonder, but it was also a frightening world. Even if I were the smartest Native American in Frijoles Canyon, I could not have possibly figured out why there was lightning, why fire worked, how I could prevent or cure disease, why my crop failed this year, why my niece was carried off by a mountain lion or by pockmarks on her face. I would have been miserable in the face of misfortune and had scant recourse except for trial and error to stave it off. Everything in the universe was haunted, blessed, cursed, and that was the only way to explain life and death in my little settlement. It’s easy today for us to underestimate the emotional reassurance that science has provided, even as it has paradoxically revealed a universe without design. Today we no longer feel that light and dark are governed by battles between gods and demons or that we must simply please a deity rather than calculate the coming and going of the seasons using a calendar to figure out the best times and practices for crop rotation. Perhaps most significantly in terms of emotional amelioration, we now no longer believe that diseases are caused by malevolent forces beyond our control and have found countless ways of understanding, preventing and treating them; even if we cannot cure every disease, the mere fact of rational understanding provides comfort. We have sculpted and reworked the material world to our own uses, to build towering structures and weapons glistening with metal and fire that would keep mountain lions at bay. And we no longer fear lightning and have harnessed similar forces of electricity for heating and cooling our houses, for connecting us to people around the planet, for being the candle that lights up both the dark and our ignorance. In that sense, there’s no getting around the fact that we have evolved many fold over the ancients. And yet it’s clear that in many ways we have also fallen behind, and that was the second thought I had as I made my way back. The physicist Niels Bohr once said that one of the cardinal principles ruling the behavior of the physical world was one he called the principle of complementarity. The principle says that a physical system embodies one or more qualities, all of which are essential for its description but none of which are visible at the same time. For instance, an electron can behave like a wave and particle, and it will behave like one or the other depending on the experiment you set up, but never both at the same time. But Bohr also extended his principle of complementarity to mean something bigger, a principle of paradox. Bohr loved paradoxes and always tried to explore them in science, but he also explored them in human affairs. During the Second World War, he found a much bigger hook to hang that hat on – nuclear weapons. He realized that the same weapons which can annihilate much of humanity can also bring an end to war. The destructive and pacifist nature of nuclear weapons can thus not be separated from each other. In one sense it’s this principle of paradox that governs the supposedly unscientific religious beliefs of the natives. For in their fear and respect for the spirits of nature is their respect for nature itself. Native Americans had a far better relationship with their natural environment that one we can even dream of, especially in developed capitalist countries. Their worship of the rain, animals and plants went hand in hand with their sustainable use of these entities. They usually took from the earth only what they needed, and they almost never hunted animals for sport but only for their skins and meat; whenever they killed an animal they offered an invocation thanking the creature for its service. They were acutely aware of climate change, especially droughts, even if they may have been largely powerless to act against it. Their religious ethos led to a great ethos of environmentalism, and it’s not possible to separate the two. In my opinion, the greatest value of Native American culture to our own modern sensibilities stems from its intimate and productive relationship with the environment. We seem to have lost that ethos of responsible environmental stewardship and sustainable practices even as we have largely and rightly cast aside the trappings of both pagan and organized religion. Westward expansion fueled in part by racial beliefs has further downplayed important values of ancient cultures. We have largely cloistered ourselves away from the forests and streams in our malls and cities, and most of us grow up without having any idea of how fragile ecosystems are because we were never forced to depend on them the way the natives did. And yet we still do. Deforestation and climate change and ocean acidification don’t stop just because we enclose ourselves in our air-conditioned cubicles. Unlike the ancients, we certainly have the technological wherewithal to withstand the adverse impacts of the environment, but we cannot insulate ourselves from our own adverse impact on key ecosystems like glaciers, forests and oceans for too long. The center has to give in someday. But the solution, at least in principle, is not too difficult to comprehend. It’s Niels Bohr’s principle of complementarity applied to Native American cultures, with a twist. We can respect their religious traditions without believing in their literal meaning, because the same traditions that make us believe in a holy spirit in nature can also make us respect nature independent of that literal meaning. In that sense we can again be the Anasazi looking on toward the horizon in an alcove high up in the mountains, but this time armed with rational scientific skepticism and a fundamental faith in a complementarity meld of man and environment. The same scientific tradition that helped us to cast off primitive beliefs now has the power to help us protect the environment. Let us use it wisely. We don’t have to pick and choose between the two. Anyone who believes that modern science has vanquished the world of wonders, fears, and angry gods is in error. Aside from technology--for which future generations will still consider us deeply ignorant and backward, if our knowledge is fortunate to have the continuity to be built upon rather than rediscovered--I don't really see how we've "evolved." Modern man is not by definition wiser than ancient man. Conspiracism is the new paganism. How can one see the rampant belief in "false flag" theories as anything other than the designs of angry, conniving gods? The Free Masons, the Illuminati, George Soros--I can go on, but these are today's angry gods. Non-descript, mysterious, all-powerful entities that are invisibly guiding current events. What's poisoning us today? GMO's? Vaccines? Fluoride? These fears have little to no basis in modern science. They are little more than mythologies developed out of ignorance to explain real or imaginary ailments. How can these be viewed with anymore sophistication than the statement, "the humors are unbalanced?" How is drinking capsaicin lemonade to "increase the alkalinity of the body," any more reasonable than wearing an amulet? In addition to explanations of the world, religions also offer value systems. Neo-atavisms such as nationalism, patriotism, or racism are as backward as old atavisms like tribalism. Yet they are largely creations of enlightenment era humanism. Have we progressed or just traded our favorite type of ignroance? Faith in the invisible hand of the free market, in the value of "pulling oneself up by one's bootstraps"--these fly in the face of objective analysis, yet people still choose to believe in them because it's what their elders believed. We may not define what we value, what we fear, and what we admire as "worship," but our actions resemble what we'd call "worship" in the context of ancient peoples. In this regard, shedding shedding religion has not enlightened us. Personally, I consider servitude to one's ego to be a type of worship (e.g., consumerism; YOLO garbage; yielding to one's every whim or desire before considering devoting energies to those in need). I see it as the crudest, most barbaric, selfish, and atavistic idol of all--and the most successful, enduring societies have all found ways to reign this in. Nature, God, Nature's God, Nature's Laws--call them what you will. It's apparent that there is only a single omnipotent presence in our universe. And I believe the purpose of natural and social sciences (and religion) is to humble ourselves before that. I don't recall who said it, but climb the mountain not so that the world may see you; but so that you may see the world. I am absolutely agree about comment that is a little bit higher. T believe that modern humanity is not smarter than ancient man! We think that we are smarter because of technology... I would like to share it with QandA team so that they get an idea.